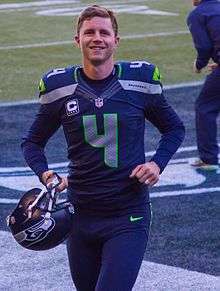 Stephen Theodore Hauschka (name commonly spelled as Steven Hauschka; born June 29, 1985) is an American football placekicker for the Seattle Seahawks of the National Football League (NFL). He won Super Bowl XLVIII with the team against the Denver Broncos. He was signed by the Minnesota Vikings as an undrafted free agent in 2008. He played college football at Middlebury College and North Carolina State. Hauschka has also been a member of the Baltimore Ravens, Atlanta Falcons, Detroit Lions, Las Vegas Locomotives, and Denver Broncos. Stephen Hauschka grew up in Needham, Massachusetts where he played on the Needham High School Rockets varsity soccer team, the varsity basketball team, and the varsity lacrosse team. He also played trombone in the NHS concert band and NHS jazz band. He didn't play football for the Rockets even though he would eventually become a successful NFL kicker, playing seasons with the Baltimore Ravens, Denver Broncos and Seattle Seahawks. He graduated in 2003, and went to Middlebury College with intent to play Division III soccer for the Panthers. In 2003, Hauschka was cut from the Middlebury Panthers men's varsity soccer team and finished the season on junior varsity. Prior to his sophomore soccer season, Hauschka was urged by a friend to try out for the football team, where he edged out freshman recruit Jacob Lister for the starting role. In his three seasons with the Panthers, he was a two-time All-NESCAC selection as both a kicker and punter. He owns the school’s single-season and career records for field goals. He was named a District I Academic All-American by College Sports Information Directors Association (CoSIDA) during his senior year. He was a semifinalist for the Lou Groza Award for the top college football placekicker. Hauschka was also a member of the Middlebury College lacrosse team. Hauschka graduated from Middlebury College with a B.A. in neuroscience in 2007. After graduating with honors from Middlebury College, Hauschka decided to forgo an acceptance to dental school and enrolled as a graduate student at North Carolina State in 2007. Since Hauschka was cut from the Middlebury College men's varsity soccer team during his freshman season, he retained one year of eligibility and won the kicking job for the Wolfpack. He then went 25 for 25 on extra points and 16 for 18 on field goals, which included a game-winning kick versus the Miami Hurricanes. At NC State, his first name was misspelled as "Steven", a spelling which he continued to use into his professional career. Hauschka was signed by the Minnesota Vikings in 2008 to share kicking duties with Ryan Longwell in the preseason. Hauschka was claimed off waivers by the Baltimore Ravens after being released by the Vikings. He was signed to the Ravens' practice squad on September 15, 2008. He was activated on October 30 to handle the long-range field goals and kickoffs, sharing kicking duties with longtime Ravens kicker Matt Stover. His first professional field goal attempt came on November 9, 2008, against the Houston Texans, where he successfully hit a 54-yard field goal. An exclusive-rights free agent in the 2009 offseason, Hauschka was re-signed on March 17 as the Ravens chose not to re-sign Stover. On November 17, 2009, the Ravens released Hauschka, after he missed his fourth attempt of the season; he converted 9 of 13 field goals (69.2%) in 2009. Hauschka tried out for the Atlanta Falcons on November 24, 2009, and for the Dallas Cowboys on December 21. Hauschka during his tenure with the Broncos. Hauschka was signed by the Atlanta Falcons on December 29, 2009 after an injury to placekicker Matt Bryant. He was waived on August 15, 2010. Hauschka was claimed off waivers by the Detroit Lions on August 18, 2010. He played two preseason games for the Lions due to the Lions starter Jason Hanson leg surgery. He was waived by the Lions on September 4, 2010. Hauschka was signed by the UFL's Las Vegas Locomotives on October 4, 2010. On October 8, Hauschka tied the league record with three field goals in one game. On December 12, 2010, the Denver Broncos signed Hauschka after a season-ending groin injury to Matt Prater. He was waived on September 3, 2011. Hauschka was claimed off waivers by the Seattle Seahawks on September 4, 2011. In a week 10 matchup against the Baltimore Ravens, Hauschka tied the Seahawks record for most field goals in a game, by scoring 5 of them, leading Seattle to a 22-17 upset. In the wildcard round against the Washington Redskins, Hauschka strained his calf, and was placed on injured reserve. On April 18, 2013, the Seahawks re-signed Hauschka. In week 4 of the 2013 season, Hauschka kicked a 45-yard field goal to give the Seahawks a come-from-behind overtime victory against the Houston Texans at Reliant Stadium. The final score was 23-20, after trailing the Texans 20-3 in the first half. Thanks to Hauschka's game-winning kick, the Seahawks went 4-0 for the first time in franchise history. The Seahawks finished 13-3 and reached Super Bowl XLVIII where they would defeat the Denver Broncos 43-8. On March 17, 2014, the Seahawks re-signed Hauschka to a three-year contract worth $9.15 million, of which $3.35 million is guaranteed. He began the 2015 season by hitting all of his first 16 field-goal attempts, including four from 50 yards or more. Hauschka was named an alternate for the 2016 Pro Bowl. Hauschka married Lindsey Jones in June 2011 shortly after Jones graduated from Boston College Law School. When he went to NC State, Hauschka's first name was inadvertently recorded as "Steven" instead of "Stephen"; he did not consider the change to be a big deal, so the misspelling stayed with him. ↑ "Ravens Release Hauschka". www.baltimoreravens.com. 2009-11-17. ↑ Hensley, Jamison (November 24, 2009). "Hauschka tries out for Falcons". Baltimore Sun Ravens Insider Blog. Retrieved 25 November 2009. ↑ Breech, John (March 17, 2014). "Seahawks re-sign K Steven Hauschka to three-year deal". CBSSports.com. Retrieved 18 March 2014. ↑ Boyle, John (December 22, 2015). "Seven Seahawks Earn 2016 Pro Bowl Honors". seahawks.com. Retrieved September 27, 2016. ↑ "Lindsey Jones, Stephen Hauschka". New York Times. Archived from the original on February 3, 2013. Retrieved November 14, 2014. ↑ Wulf, Steve (June 13, 2014). "Steven Hauschka's road to SB XLVIII". ESPN. Retrieved November 14, 2014.